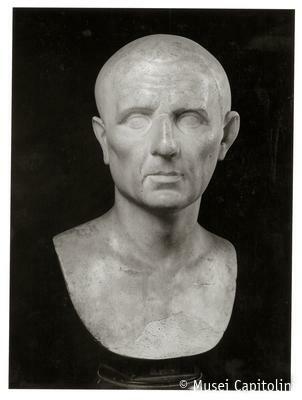 The bust, cut down just below the chest, portrays a middle-aged man, as it is suggested by the deep wrinkles on the forehead and to either side of the nose; the bust was inserted in a statue. The head is slightly turned to right; the face is characterized by prominent cheekbones, wide, almond-shaped eyes marked by arched eyebrows, hooked nose, tight lips and protruding chin. The hair follows the shape of the skullcap so closely that one gets the impression that the man is bald. Actually, the hairline is visible along the brow, above the ears and on the nape. The portrait, datable to the 1st century AD, was purchased for the Capitoline Museum from the collection of cardinal Alessandro Albani in 1733.